Women’s “Firsts” – History Provides Context | Bonnie Reilly Schmidt, Ph.D. Recent revelations that Albert Einstein advised Marie Curie in a letter to ignore the “reptiles,” the journalists who printed “hogwash” about her personal life, have made for fascinating reading. Einstein’s letter to Curie was a beautifully written piece of encouragement that reminded Curie that her intellect was most important. 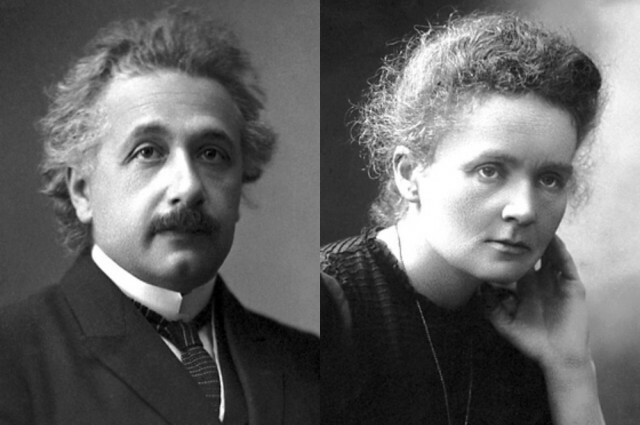 Einstein recognized brilliance when he saw it; Curie was an incredibly gifted scientist. She was the first woman to obtain a doctorate in a scientific field in France (1903), the first female professor at the Sorbonne (1906), and the first woman to receive a Nobel Prize (1903) for Physics. In 1911, she received a second Nobel for Chemistry, the first and only person since that time to be recognized in two different sciences. Being a brilliant and successful scientist was not enough however, because Curie was still a woman. When she crossed the gendered boundaries of appropriate feminine behaviour by entering into an affair with a married colleague who was estranged from his wife, Curie was vilified in the press. She was accused of sullying the name and reputation of her late husband, Pierre, prompting Einstein to write his letter. When members of the Nobel committee tried to discourage Curie from accepting her prize in person because of the negative publicity surrounding her private life, Curie responded, “The prize has been awarded for the discovery of radium and polonium… I cannot accept that the appreciation of the value of scientific work should be influenced by libel and slander concerning private life.” Curie quite wisely insisted that her scientific work was separate from her personal life and picked up her prize in person. History is filled with women who have achieved groundbreaking firsts. When the Royal Canadian Mounted Police (RCMP) decided in 1974 to hire women for the first time, they did not want any one woman to claim that she was “the first” female Mountie. The police force may have had a number of reasons for this approach, but the official reason was that they did not want the pressure of being “the first” placed on one woman. It was a paternalistic attitude that was based on the assumption that a woman would be unable to handle the media’s intense scrutiny. As a result, all thirty-two of the first female members of the police force were sworn in together at exactly the same time across the country’s five time zones. It too, was “a first,” a decision that has never been repeated in the history of the RCMP. It was just the beginning of the unprecedented attention on the women, both inside and outside the RCMP, who dared to transgress gendered boundaries that would influence their working lives on a daily basis. Our fascination with the correspondence between Einstein and Curie a century ago probably has a lot to do with our familiarity with the ongoing issues over gender that exist in our society today. But it also serves as a reminder of the importance of considering context when we think about the accomplishments of women in history. Then we will more fully understand the significance of their achievements.